OCTOBER 5, 2018 BY EMILY T.
Ready for a change of pace and a change of scenery, my gal pals and I scanned maps in search of a road trip to an o-the-beaten-path destination. 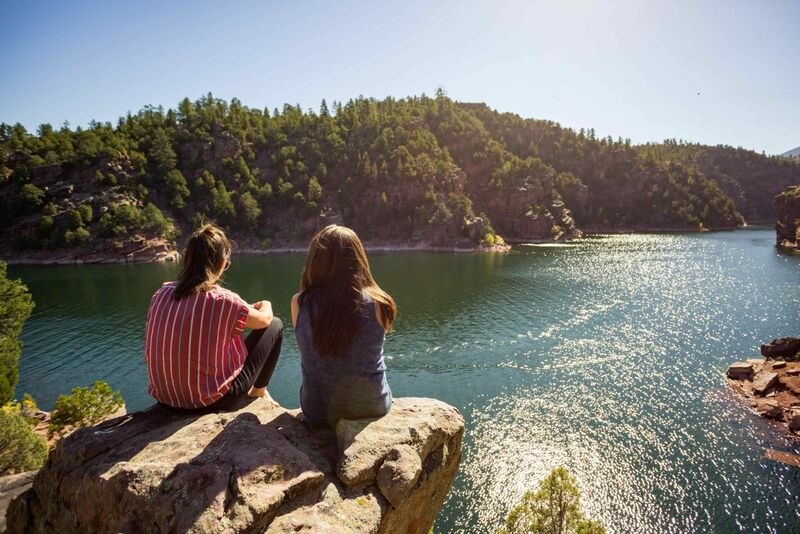 We landed on the idea to visit Flaming Gorge, a massive reservoir straddling the Utah and Wyoming border. The sapphire blue lake is surrounded by towering red clis, and we knew with the sheer size alone we’d nd some quiet up there. We were right. 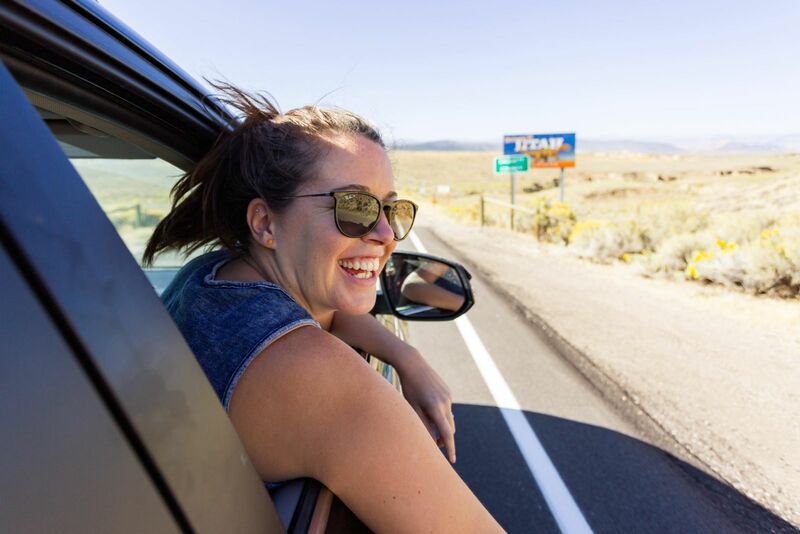 Truly, driving is half the fun of a road trip. It’s rare for the three of us girls to all get together, but when we do–it’s a riot. We jabber, we laugh, we listen to all types of music, we roll the windows down and let the country air blow in. 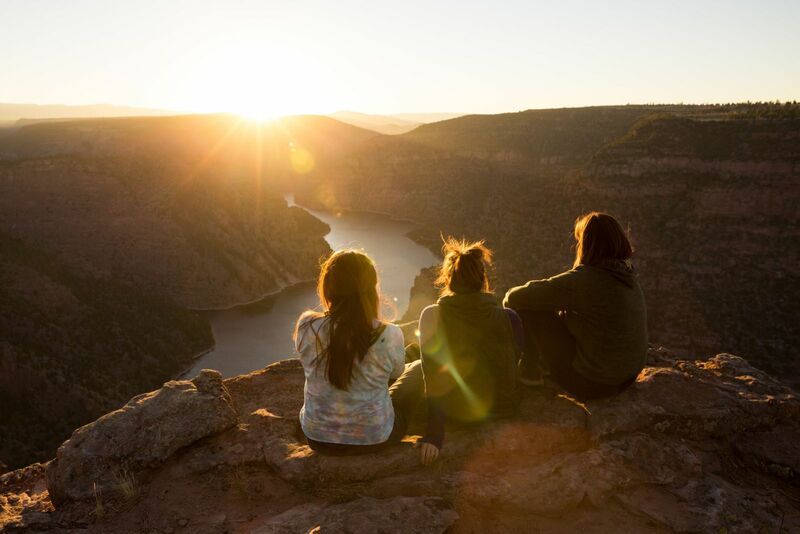 The scenic byway that wraps around Flaming Gorge Reservoir was the perfect highway to really indulge in all of our girlish road trip behaviors. My friends are patient when I ask them to pull over as I am traditionally the “photographer friend”. 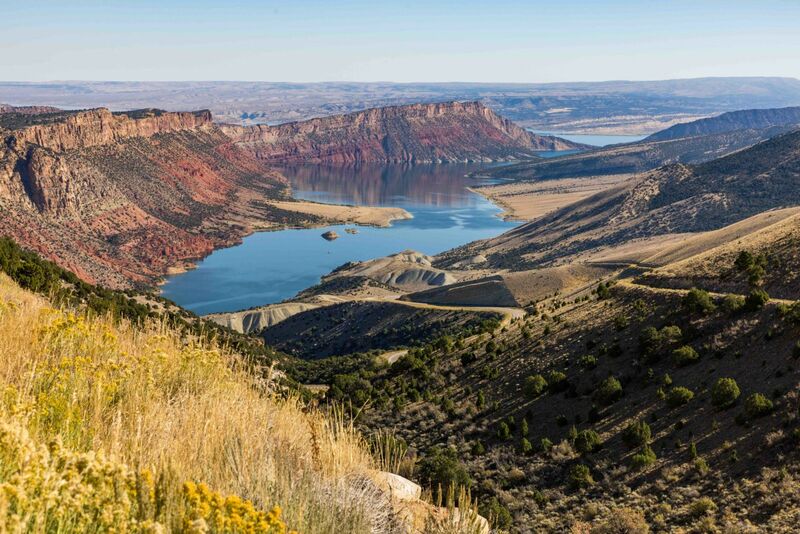 And believe me, there are an insane number of scenic overlooks around Flaming Gorge! Oh, and we happened to be cruising through in mid-September when the autumn colors were peaking, adding pops of yellow and orange to many photos. My friends poke fun at me because I’m more likely to recommend camping trips over those to a spa or resort. It’s in my blood, and I just love being outdoors! 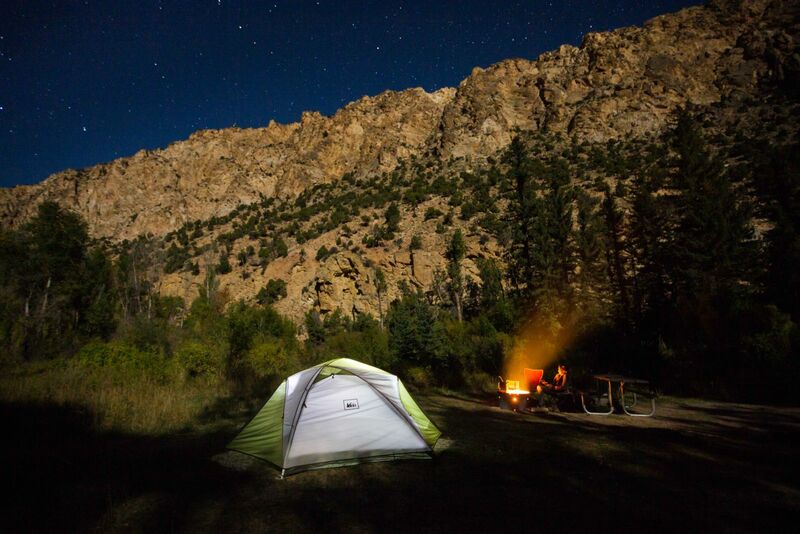 We settled in at Carmel Campground for a couple of nights, perched along Sheep Creek. Trees and tall grasses spread throughout the grounds and sang softly as they blew in the wind. We were lucky enough to camp there during the Kokanee Salmon run on the creek, where we watched groups of salmon swimming upstream to spawn. Their red bodies ickered in the clear water, oering a super unique experience. 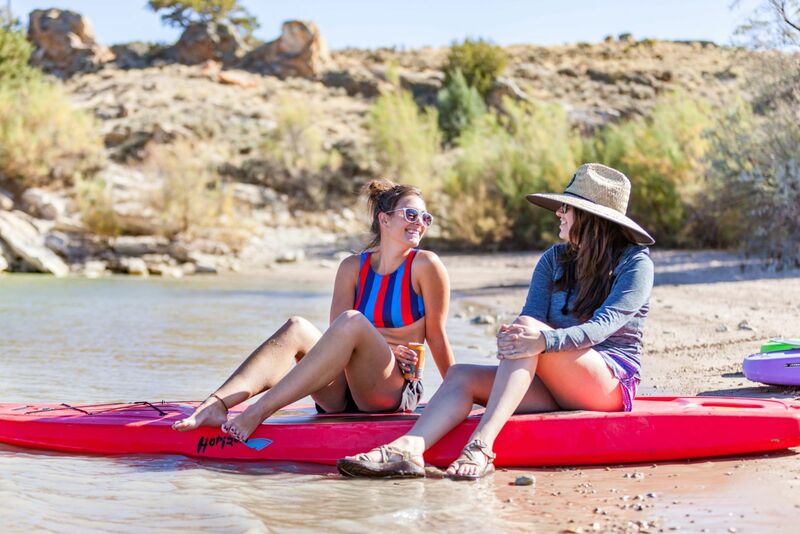 With the help of Wild West Paddle Company based in Manila, Utah, we were able to get some stand up paddle boards (SUP) to the lake’s edge and explore the beautiful scenery. It was a bit windy in the afternoon, and while we had a tailwind heading to a nearby beach, we all quietly dreaded the return trip. At the beach, we pulled our boards onto the sand and soaked up the rich sun. There was no one around, and we explored rock formations adjacent to the water’s edge. Finally, we put our boards back on the water, ready to face the wind and waves that lie ahead. It wasn’t easy, but we cheered each other across the water until we reached home base. 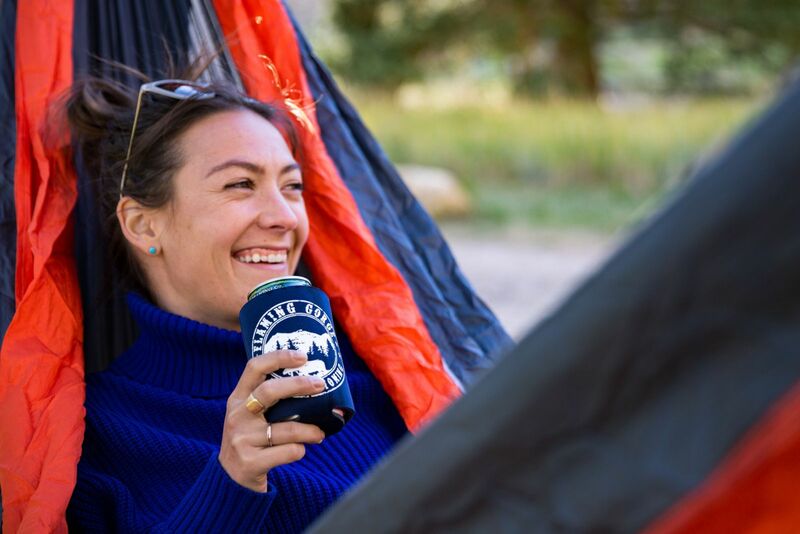 We cracked a beer to celebrate the victory and laughed about the paddle adventure we had just shared. 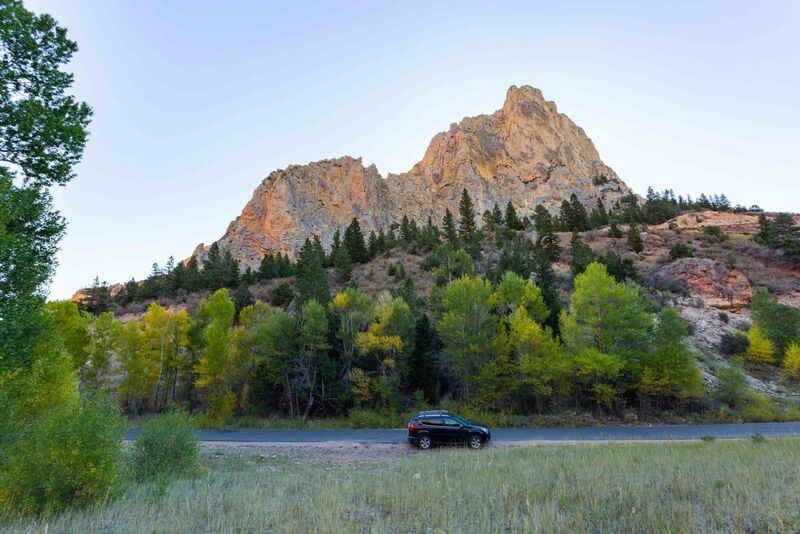 We’ve all heard about scenic byways, but have you driven a scenic “backway”? Me neither... until now! The Sheep Creek Geologic Loop is a scenic backway that only spans about 13 miles, but it took us a couple of hours to complete since we kept ogling at the twisted rock landscapes. As we navigated through the rock formations, we were slowly gaining elevation and within a snap we were cruising through a bright yellow aspen forest. The variety of terrain on this route made for a particularly interesting drive, and was well worth a detour. For the record, if you see a “scenic backway” along a “scenic byway”, it’s likely worth the effort! Thank you for visiting http://www.flaminggorgecountry.com/road-trip-to-flaming-gorge! Be sure and revisit flaminggorgecountry.com frequently for content updates and more.